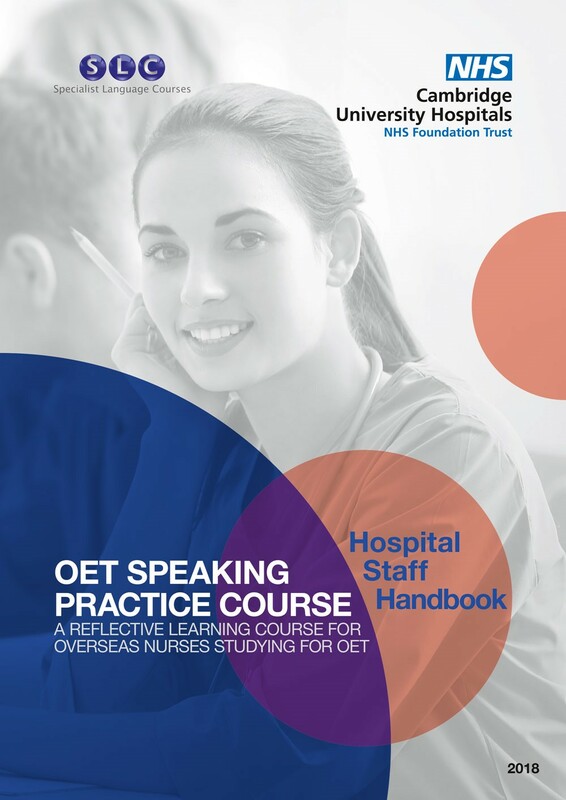 Specialist Language Courses and the Clinical Education team at Addenbrooke’s Hospital, Cambridge have partnered to create and publish a new course designed to support nurses studying for the OET English for Healthcare language test. SLC have been working with groups of European nurses arriving in Cambridge since early 2017, helping them achieve the scores in the English language tests required by the NMC to register in the UK. Initially this was the IELTS academic English test and more recently, OET. Throughout this time, SLC and the Clinical Education team have partnered closely to make sure that courses are effective and successful. The latest example of collaboration is to create an OET Speaking course led by SLC teachers and Addenbrooke’s ward managers. The course is integrated into the tutored course and is designed to activate the language the nurses learn in a practical setting, so consolidating and extending classroom learning. The course is formally set out, with a student workbook and a staff handbook for ward managers (or other mentors working with the nurses). Every week, nurses work on set OET role plays, practising and receiving structured feedback from both SLC tutors and hospital managers, covering linguistic and clinical communication skills. There is a strong reflective element in the course, in line with NMC principles. As OET tests both language and communicative effectiveness in healthcare, the OET Speaking course blends seamlessly with the tutored course delivered by SLC, while involving ward managers and other hospital staff in their nurses’ English language education. The course is being piloted at Addenbrooke’s Hospital and the early feedback has been extremely positive. 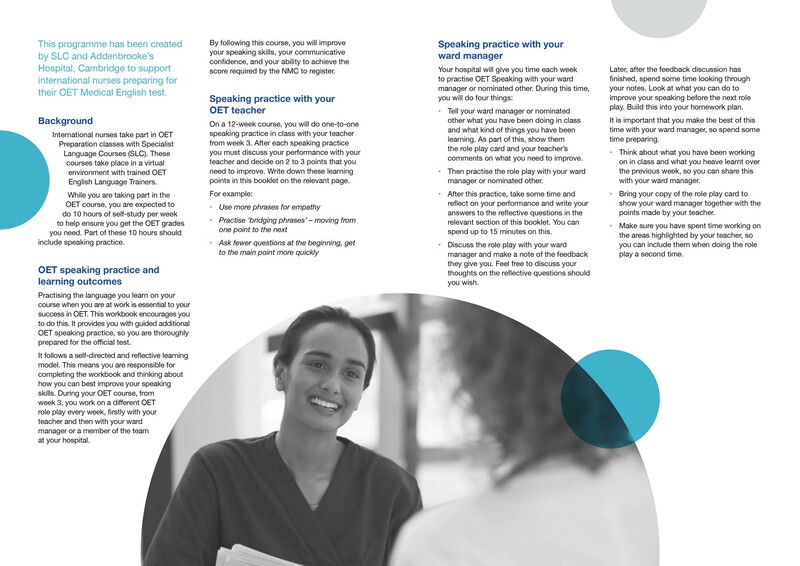 In the future, we very much hope that NHS Trust hospitals and private healthcare employers will look at incorporating the Speaking course into any OET preparation programmes their nurses are on. For more information about the course and to see review copies of the candidate workbook and staff handbook, contact Chris Moore on chris@specialistlanguagecourses.com. SLC is the UK’s leading provider of Medical English training services. SLC trains nurses and doctors to achieve the scores they need in the Occupational English Test (OET) to register in English-speaking countries. SLC’s digital Medical English and Exam Preparation services enable thousands of medical professionals and students around the world to work, travel, study, research, develop themselves, and communicate with each other in English, the lingua franca of medicine. Cambridge University Hospitals is one of the largest and best known trusts in the country. As the local hospital for our community we deliver care through Addenbrooke’s and the Rosie hospitals. We are also a leading national centre for specialist treatment, a government-designated comprehensive biomedical research centre, one of only six academic health science centres in the UK and a university teaching hospital with a worldwide reputation. Building on these different elements, our vision is to improve people’s quality of life through innovative and sustainable healthcare.